President Trump's threat to blow up NAFTA once seemed far fetched. But life without the U.S.-Mexico-Canada trade agreement could become a reality. The fourth round of the renegotiation of NAFTA ends Tuesday, and little progress on tough issues has been made thus far. Trump routinely threatens to withdraw from the pact if negotiations go south. As president, he has the authority pull out of NAFTA on his own, but he must give Mexico and Canada six-months notice. American farmers, restaurant workers and some manufacturing employees would get hit hard if Trump pulls out of NAFTA, according to an in-depth analysis published in August by ImpactECON, a consulting firm in Colorado. Its economists ran two post-NAFTA scenarios. Both possibilities baked in U.S. tariffs on imports from Canada and Mexico -- and retaliatory measures against American exports. 2) American wages don't decline: 1.2 million low- and high-skilled workers lose their jobs. Why? Because workers would still be relatively expensive while imported products would become more expensive due to tariffs. Top of the chopping block: Service workers. That includes waiters, cafe baristas, retail store salespeople and a slew of other, mostly low-skill, low-pay positions. Those jobs rely on cheap imports of clothing, food, machines and many other items. Car plants in the United States would lose nearly 17,000 jobs; textile factories 4,400 positions; cattle ranchers and fisheries roughly 9,500; food companies 26,000 employees. However, those losses would be partly offset by gains in industries like machinery, electronics, sugar production and chemical sales. Still, the overall effect would be negative, the study concludes. In the big picture, about 14 million American jobs depend on trade with Mexico and Canada, according to the U.S. Chamber of Commerce, a business organization that opposes Trump's trade agenda. Trump says NAFTA triggered an exodus of good-paying manufacturing jobs to Mexico. Robert Scott, an economist at the Economic Policy Institute, estimates that roughly 800,000 American jobs went to Mexico between 1997 and 2013. NAFTA became law in 1994. The nonpartisan Congressional Research Service concluded in 2015 that NAFTA neither caused an exodus nor sparked a job boom. It said the deal's economic impact was modest. What will not be modest is the change in tariffs on American products sent to Canada and Mexico. 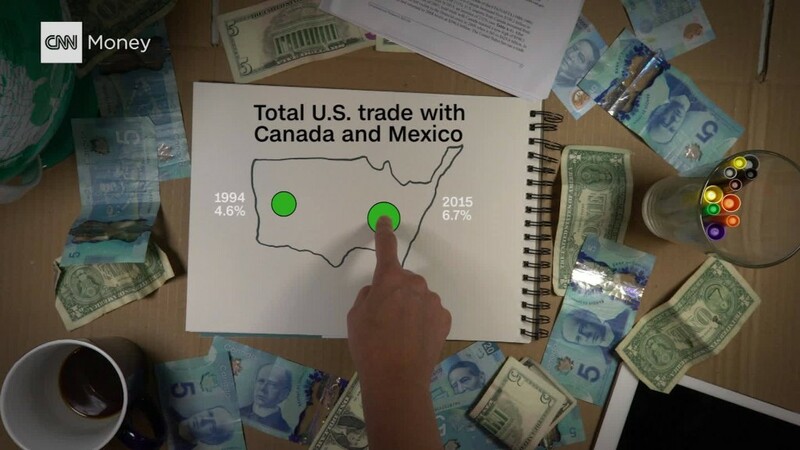 NAFTA removed almost all taxes at the border to create a free trade zone. But without trade deals with the U.S., both nations are expected to slap stiff tariffs on American exports heading into their lands. For example, American livestock currently crosses the Mexican border tariff-free. Take away NAFTA and the average tariff Mexico would put on south-bound steaks would rise to about 58%. And that would depress American exports to Mexico. Canada and Mexico would also raise tariffs higher than the United States in some cases, at least initially. With NAFTA, cars and auto parts face no taxes. Without it, Canada slaps on a 4% tax and Mexico 13%, while the U.S. puts a 1% tax on Canada and a 3.5% tax on Mexico.